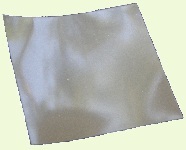 Mylar Curing Film Strips are used to hold the resin in place. Due to the capillary action between the windshield and the curing strip, the resin will lay very flat and evenly distributed under the strip during the curing operations. This prevents there being a bulge or lump of resin at the base of the repair and an indention over the chip cavity. It also ensures the resin cures in a thin layer on the glass surface which can easily be scraped off the surrounding glass and smooth to the surface of the glass around the chipped area. 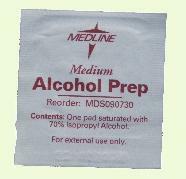 Alcohol Towelettes are used to clean around the damaged area prior to making repairs and for a cleanup following the completion of the windshield repair. Since most windshields collect a little road dirt every day they generally need to be cleaned before an adhesive is applied to a damaged area on the windshield. The dirt also makes attaching anything to the glass a bit tricky since adhesives tend to stick to the dirt and quickly peal away with a layer of the dirt. You should clean an area at least a couple of times the size of the adhesive disc that will be used in repairing your windshield. In most cases, you can clean the glass sufficiently for the adhesive to stick properly just by rubbing the dirt away. However if there are any waxes or detergents on the surface of the glass, you should use an alcohol towelette or equivalent before starting the repair. After the repair you can again clean the area to remove any residues from the repaired area. Avoid smearing dirt into the damage as you may not be able to remove all of it prior to the repair and it might discolor the resin within the repaired damage. Note: The Alcohol or Alcohol Towelette used to clean the windshield should contains 70% pure isopropyl alcohol and 30% pure water. You must wait a few minutes for the glass to dry after cleaning, and do not use any substitute wipes or Towelettes that may contain oils or perfumes as they will contaminant the break. Also, if the repair cannot be completed soon after the break, cover the damaged area with piece of cellophane tape to protect the damage from contamination.